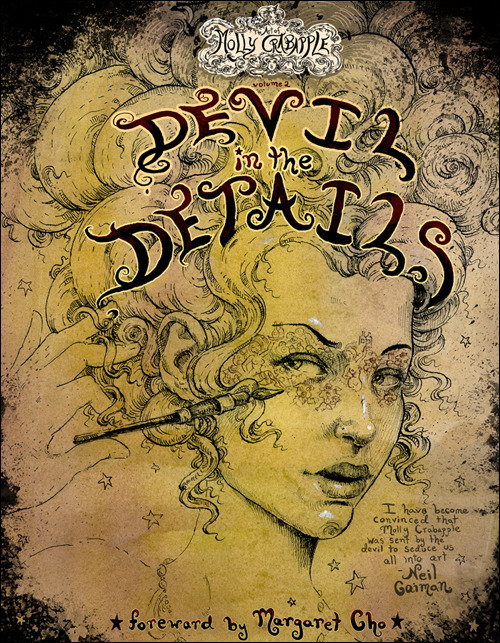 Devil in the Details will be hitting comics shops this Wednsday. Fine artist, illustrator, and comics creator Molly Crabapple captures the absurdity of modern life in intricate, theatrical detail in her fine art work, drawing inspiration from politics, polite (and not-so-polite) society, and hundreds of years of literature. Her work is burlesque-inspired in the broadest definition of the word – deftly satirizing the powerful with adorably sinister animals, steampunk-tinged machinery, and of course, beautiful girls. But it’s not all fantastical – when Occupy Wall Street broke out, Molly was there, capturing the immediacy of the revolutionary feeling in pen and ink. In a new 48-page book from IDW, you can get Molly’s art in gorgeous full-color, work that’s decorated glamorous nightclubs, museums and galleries, and protest signs and occupied spaces around the country. Comedian Margaret Cho contributes the forward. This entry was posted in Events on July 23, 2012 by Molly.